BUCYRUS — CONTACT Crawford County is taking registrations for its spring training class which begins April 23 in Bucyrus. Classes are Monday and Tuesday evenings from 6:30-8:30 p.m. for six weeks. The location will be provided when you call to register. 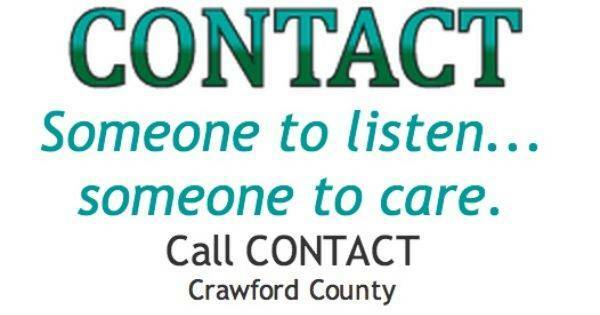 Classes will prepare new volunteers to answer the phones at Crawford County’s 24-helpline service where people call for information about local services, assistance with crisis services, or just to talk if someone is upset or lonely. Initial training provides 30 hours of classroom preparation with an emphasis on good listening skills and knowledge of available services and how to access them. Some topics included are domestic violence, mental health, drug and alcohol addiction, and suicide. Completion of the training is a pre-requisite for volunteers at CONTACT. In addition, an apprenticeship is served working in the call center with an experienced telephone worker. Anyone who is interested in knowing more about this service is invited to come to the first meeting, an Orientation, which explains what we do and to answer questions about Helpline work in general. For more information and to register, please call CONTACT at 419-562-9010 or 419-468-9081 anytime.